Women’s ski innovator Jeannie Thoren and ski goggle pioneer Bob Smith, both with strong ties to Sun Valley, were among the 10 newest inductees to the U.S. Ski and Snowboard Hall of Fame announced Thursday, Oct. 30. The 10 athletes and sport builders making up the Class of 2014 represent the largest class of inductees to enter the Ski Hall of Fame since 1984, when 10 were also inducted. Inductees are Olympic champion snowboarder Ross Powers, World Alpine Championship medalist Erik Schlopy, noted big mountain skier Chris Davenport, ski instruction pioneer Curt Chase and Smith. Others are resort designer Joe Cushing, World Cup race winner Kristina Koznik, alpine development leader John McMurtry, Thoren and Ralph Miller, one of the great American ski racers from the 1950s. There were 16 nominees, with 10 chosen. Their induction will take place April 11, 2015, during the Skiing History Week and Hall of Fame Induction at Steamboat Springs, Colo. There will also be a special enshrinement ceremony weekend for honored members at the home of the Hall of Fame at Ishpeming, Mich., Sept. 18-20, 2015. The new inductees bring the total to 404 honored members in the U.S. Ski and Snowboard Hall of Fame. Nominees are screened by a Hall of Fame Selection Committee before going on a ballot where around 200 members of the Hall of Fame National Voting Panel elect the newest Honored Members. Thoren, from Minnesota, is regarded by many as the “Johnny Appleseed” of women’s skiing. She lived in the Wood River Valley mainly in the late 1970s and 1980s. When Thoren started skiing in the 1960s, there was no women-specific ski equipment. She began to customize her own. Tracing a direct correlation between changes in her gear and improvement in her technique, she made it her mission to help other women ski better by making their equipment better. She held the first women’s gear clinic at Buck Hill, Minn., in 1981. She became a pioneer in developing women’s specific ski equipment, which helped women ski better because they were using equipment better suited to their physique. Recognizing that women have smaller feet and a lower center of gravity than men, she focused on better-fitting boots, heel lifts in boots, cants under bindings and moving bindings forward on the ski. 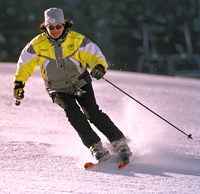 In 1986, she designed what is believed to be the first women’s ski, for the Austrian company Blizzard. For nearly 20 years, beginning in 1988, she conducted 70 women’s ski equipment seminars annually around the country in her effort to improve the sport for all women. Thoren traveled every winter 1988-2006 with a trailer of gear in tow. The Exclusive Carve Ski she designed for Dynastar became Ski magazine’s 2007 Ski of the Year. In 2009, she opened the Jeannie Thoren’s Women’s Ski Center in Vail, Colo.
Smith was a dentist turned goggle inventor who changed skiing, which was his passion, when he founded his eyewear company in the 1960s. Smith Optics was founded literally from his kitchen table in 1965 in Sun Valley, where he developed a thermal lens goggle that didn’t fog up when used on the ski slopes. It was an invention that was enjoyed by hundreds of thousands of skiers initially and continues to have an impact on the experience of skiers and snowboarders today. Anxious to give back to his skiing passion, Smith toiled at home with dental tools, glue and foam to make each goggle by hand. He constantly improved his goggles—adhering to advice, ideas and criticisms he solicited from users. Dr. Smith passed away in 2012. The next year, he was elected to the Sun Valley Ski Hall of Fame and Intermountain Hall of Fame. Check today’s Idaho Mountain Express website for more details about the other new inductees.